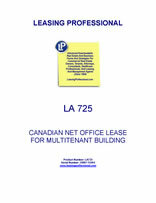 This Canadian lease form is designed for an office tenant occupying office space which is leased on a net basis by the landlord. The tenant is responsible for its rent under the lease as well as its proportionate share of all other occupancy costs. This form also provides for a personal guarantee (covenants) from one of the tenant's shareholders. 3.01 BASIC RENT. The Tenant shall pay to the Landlord monthly in advance a rental of $ ___________ payable in lawful money of Canada (herein referred to as the "Basic Rent"') and all additional rental as hereinafter provided, commencing on the Commencement Date and thereafter on the first day of each and every month of the Term of this Lease without any deduction, defalcation or abatement save as herein expressly provided. 3.02 PREPAID RENT. The Landlord acknowledges receipt from the Tenant of the sum of $_______ to be applied toward the last 1 months' rent of the Lease granted hereunder. 3.03 ADDITIONAL RENT FOR COMMON COSTS. The Tenant shall pay to the Landlord as additional rent the Tenant's Proportionate Share of Common Costs in addition to the Basic Rent hereinbefore provided. The Tenant's Proportionate Share of Common Costs for the portion of the Term commencing on the Commencement Date and ending December 31 of the year of the Commencement Date is estimated to be $_____________ Dollars ($_______ per month) and the Tenant shall pay such amount to the Landlord in lawful money of Canada in equal monthly installments in advance commencing on the Commencement Date and thereafter on each day fixed for the payment of Basic Rent to and including the first day of December in the year of the Commencement Date. Prior to commencement of each ensuing calendar year of the Term, the Landlord shall deliver to the Tenant a statement setting forth the Landlord's reasonable estimate of the Tenant's Proportionate Share of Common Costs for such ensuing calendar year and thereafter during such calendar year the Tenant shall pay to the Landlord monthly in advance on each date fixed for the payment of Basic Rent and amount equal to one twelfth of the Tenant's Proportionate Share of Common Costs, provided that in the calendar year in which the Term expires the Tenant's Proportionate Share of Common Costs in respect of the calendar year shall be paid proportionately by equal monthly installments over the remainder of the term. 3.04 REPORTING ON TENANT'S PROPORTIONATE SHARE OF COMMON COSTS. As soon as reasonably practical following the end of the period for which such estimate payments of Tenant's Proportionate Share of Common Costs have been made, the Landlord will furnish to the Tenant a statement showing the actual amount of Tenant's Proportionate Share of Common Costs settling forth in reasonable detail Common Costs incurred by the Landlord during such period and the Landlord and the Tenant covenant and agree each with the other that if an overpayment of the Tenant's Proportionate Share of Common Costs has been made by the Tenant, the Landlord will credit such amount to the Proportionate Share of Common Costs for the ensuing period and, if there is no ensuing period, such amount shall be paid to the Tenant, and if an amount remains owing to the Landlord in respect of the Tenant's Proportionate share of Common Costs, the Tenant will forth with pay such amount to the Landlord. The Tenant and the Landlord covenant and agree each with the other that the covenants contained in the Article 3.04 shall survive notwithstanding termination of expiration of this Lease. 3.05 RECOVERY OF ADDITIONAL RENT. The Tenant's Proportionate Share of Common Costs, the management fee hereinbefore referred to and any other sum expressed to be payable to the Landlord hereunder as additional rent (herein collectively referred to as "Additional Rent") shall be recoverable by the Landlord from the Tenant in the same manner as Basic Rent reserved and in arrears under the terms hereof. 3.06 INTEREST ON AMOUNTS IN ARREARS. When Basic Rent or any Additional Rent (including interest thereon, of any) payable hereunder by the Tenant to the Landlord is in arrears, the same shall bear interest at the rate of PRIME +____% per centum per annum and such interest shall be and is agreed to be due and payable on demand as additional rent reserved hereunder. 3.08 NET LEASE. The Tenant will well and truly pay to the Landlord all Basic Rent and Additional Rent required to be paid by the Tenant pursuant to this Lease without and deduction, defalcation, abatement, or set-off whatsoever, it being the intention of this Lease that all expenses, costs, payments, and outgoings incurred in respect of the Premises, the Lands and the Building (unless otherwise expressly stipulated herein to the contrary) will be borne by the Tenant and other tenants, and, that rent will be absolutely net to the Landlord. Upon request by the Landlord, the Tenant will deliver promptly to the landlord, for inspection, receipts for payment of all charges payable by the Tenant pursuant to the Article 3.08 with were due and payable up to one month prior to such request, and will furnish to the landlord, upon request, evidence of payment before ___________ in each covering payments for the preceding year. 3.09 IRREGULAR PERIODS. If, for any reason, it becomes necessary to calculate Basic Rent or Additional Rent for irregular periods an appropriate pro rata adjustment will be made on a daily basis in order to compute such rent for such irregular periods as a the date of termination of the Term. 3.10 DISPUTE AS TO COSTS In the event of any dispute as to the amount of any monies to be paid by the Tenant pursuant to this Lease, the certificate of an independent chartered accountant appointed by the Landlord, determining such amount, will be final and binding on the Landlord and Tenant. 3.11 POST-DATE CHEQUES. The Tenant agrees to deliver to the Landlord upon occupancy pursuant to this Lease a series of post-dated cheques to cover the monthly installments of Gross Rent and Additional Rent for management hereinbefore reserved for the period ending ___________________ in the year of the Commencement Date and thereafter prior to ______________ in each year of the Term a series of post-dated cheques to cover the monthly installments of Gross Rent for Management for Each ensuring calendar year or portion thereof of the Term of this Lease.